Day 2 of Bluesfest was a really exciting day for me. One of my very favourite bands was playing: Dragonette. 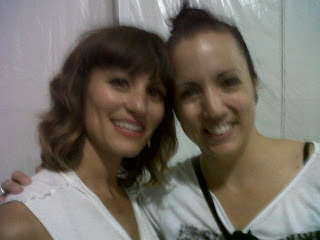 I have seen Dragonette live twice already and I am a huge fan! Seeing as they've become more popular since collaborating with Martin Solveig on the successful single "Hello", I knew that there would be lots of people going to see the show. They started their set with "Hello", pumping up the crowd from the very beginning. They also played two other international hits: Big in Japan (Martin Solveig) and Fire in Your New Shoes (Kaskade). In addition, most of the songs from their set were new songs, set to be released on their new album in September. Although I didn't know any of them, they were really good. It was a good preview to the new album and I'm looking forward to the release date. They also played a couple of songs from "Fixin' to Thrill" and one song from "Galore". I wish that they played more of their older songs. It was obvious that they catered their set-list to include more of their recent, mainstream material. I would have definitely preferred the original Dragonette material. Highlight of the show: "Pick up the Phone". The main act on the main stage that evening was LMFAO. First, I need to mention the awful, neon-coloured outfits that patrons were wearing. It was hideous, embarrassing and frankly, it hurt my eyes. I saw people wear things in public that one should never wear, ever! Second, although I have most likely danced to an LMFAO song at a bar at some point in my adult life, I am not a fan nor do I respect these guys as musicians. Their music is catchy and appropriate for nightclubs. However, I don't find it remotely creative nor do I appreciate a neon speedo. Luckily for me, Plants & Animals was playing at the River Stage at the same time. Plants & Animals put on a great set, playing both new and old songs. The show seemed very intimate with a small crowd gathered at the River Stage. There was a great energy in the air. The crowd seemed very pleased with the show and the song selection too. The River stage is by far my favourite stage at Bluesfest because it overlooks the water and it is so stunning at nightime (Iron & Wine, 2010). Highlight of the show: "Bye Bye Bye". After the Plants & Animals show was over, I headed towards the main stage to meet my friends (who were watching LMFAO). Walking by the Merchandise tent, I saw that Martina and the boys from Dragonette were still there, finishing up their autograph signing session. I decided to stop and say hi. Martina and I chatted for a couple of minutes. She's lovely and so nice! I love her! Overall, I had a fantastic evening and saw two amazing bands perform. I had some great company. I danced a little (although I am still sore from the crazy dancing from Day 1). Also, meeting the lead singer of Dragonette was a perfect way to end the evening! Enjoy this video from one of my favourite Dragonette songs! Stay tuned for Day 3, which includes City and Colour, David Gray, Sleigh Bells and the Arkells.